I’m in love…again and again…with all kinds of new food, almost every time I try something that surprises me. That sounds very “American”, I know – always wanting more and new food. My new love? Yep, the picture says it all – Coconut Peanut Butter. Truth be told, I don’t love peanut butter, and in fact if there’s any other type of nut butter in my fridge, I’ll go for that. But, oh this coconut peanut butter. It does it for me. Mom and I went country yesterday as I had some business up there. I was early for an appointment and so we stopped at the old Waialua Sugar Mill. The owner(s) now use it as a place to house a farmer’s market as well as process and sell Waialua coffee beans and soon chocolate, which I understand they are in the process of making from their own cacao beans they are growing up there. Inside part of the mill is a little shop that sells all kinds of jams, jellies, coffee beans, shave ice (why isn’t it “shaved ice”, past tense?) and a lot of other stuff made locally. The coconut peanut butter caught my eye. Just coconut, peanuts and local honey. My breakfast this a.m.: coconut peanut butter toast with a side of fresh Maui pineapple and cup of 100% Kona. It doesn’t get much better than that for a lady who has quite a sweet tooth. After the mill and my appointment, we headed to Haleiwa Joe’s which is quite a tourist trap and the food is really mediocre at best in my opinion, but it’s a tradition for mom and me, as well as for Busaba and me, to go get their fried calamari. The calamari comes out nice and crispy with a very light breading, and they serve it with their version of a sweet chili dipping sauce, much thinner and lighter than the bottled stuff. It’s pretty darn good. Rachael – OMG! 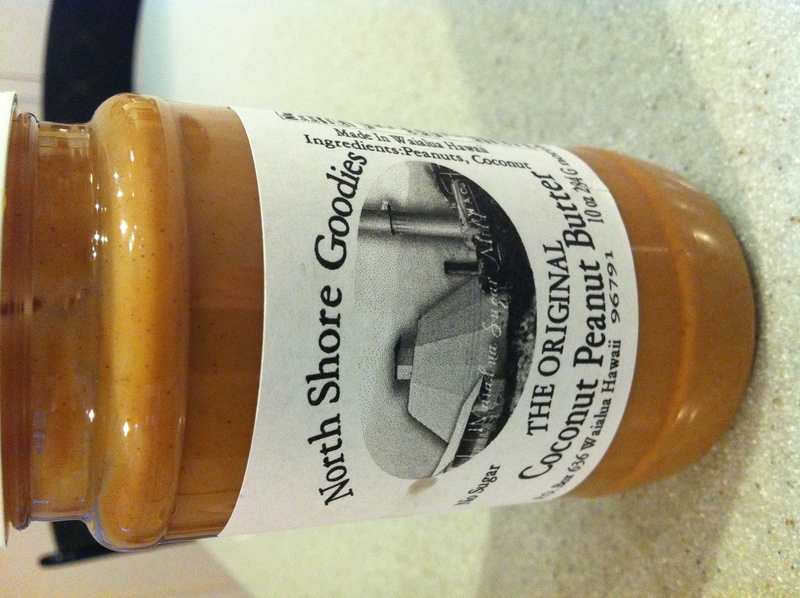 My mom and boyfriend and I went to the North Shore on Saturday and I tasted this peanut-coconut-butter. It was amazing! I didn’t think the two flavors would work together but they do. I also purchased some amazing honey from the lady.